>>>This is a multi-unit set and the shipping cost will be adjusted to that of 15 DVDs. To learn more about the shipping cost, please visit our Help Page and look for shipping information. Creator David Chase's drama series stars three-time Emmy?winners James Gandolfini as Tony Soprano and Edie Falco as Tony's wife Carmela, plus Lorraine Bracco as therapist Dr. Jennifer Melfi, Emmy?winner Michael Imperioli as Tony's nephew Christopher Moltisanti, and Dominic Chianese as Uncle Junior. 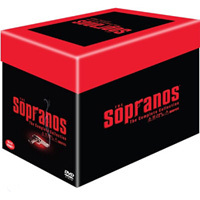 Also on hand for Season six are regulars Robert Iler as Anthony Soprano, Jr., Jamie-Lynn Sigler as Meadow Soprano, Tony Sirico as Paulie Walnuts, and Steven Van Zandt as Silvio Dante.